What do you do when there’s nothing to do? Here’s a book about exploring the delights of unscheduled time. No piano lessons, sports practice, afterschool classes, homework. Instead, bestselling author Douglas Wood gently points children to the magical worlds of the imagination, the mysteries of nature, and the deep satisfaction of finding out things on one’s own. The perfect antidote for the overscheduled child, this wise yet playful book revels in the simple joys life has to offer.With brilliant, multifaceted patterned artwork that is the hallmark of Wendy Anderson Halperin, Nothing to Do reflects a wholly original vision of children’s creativity. 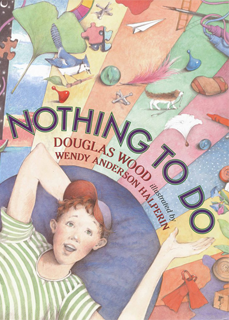 Douglas Wood’s text combines with Wendy Halperin’s cornucopia of images to demonstrate that it is possible to find an infinite number of interesting things to do on those unscheduled days—something that is becoming less frequent in a child’s life…or adults for that matter!